Fun fact: Jose Molina‘s FanGraphs player ID number is 25. Mike Trout’s is 10155. All right. According to numbers provided to me by Matthew Carruth, last year there were 78 catchers in baseball who caught at least 1,000 called pitches. Carruth defines his strike zone not by the rule book, but by an average of the strike zones big-league umpires actually call. Out of those 78 catchers, Molina posted the fifth-lowest rate of pitches in the zone called balls. Molina tied for the second-highest rate of pitches out of the zone called strikes. Overall, Molina posted the highest rate of extra strikes per game, at +2.5. The other guys over 2 were David Ross, Chris Stewart, and Jonathan Lucroy. Molina caught more than 6,000 called pitches. We’ve had an idea for some time now that Jose Molina is an expert pitch-framer. We don’t really know what pitch-framing means. I mean, we can see when a catcher steals an extra strike, and we can see when a catcher costs an extra ball, but we don’t know how much it all actually matters. We don’t know how much is on the catcher, how much is on the pitcher, and how much is on the umpire. We don’t know how the runs add up, and framing, of course — or receiving, if you prefer — is only one part of a catcher’s game. Framing is almost entirely separate from pitch-calling, which might well be a bigger deal. This research is in its infancy, or maybe toddlerhood, and I think this is the best way to sum things up: Joe Maddon has claimed that, last year, Molina’s framing was worth about 50 runs. Opposing batters posted a .659 OPS with Molina behind the plate, versus a .640 OPS with Jose Lobaton behind the plate and a .636 OPS with Chris Gimenez behind the plate. We don’t actually have a handle on framing quite yet. But it is pretty clear that it’s a real, sustainable skill, that it’s something at which some guys are good and other guys are bad. Which makes it fascinating, because it allows us to examine the hows and whys. Why is Ryan Doumit such a bad pitch-framer? What does he do? 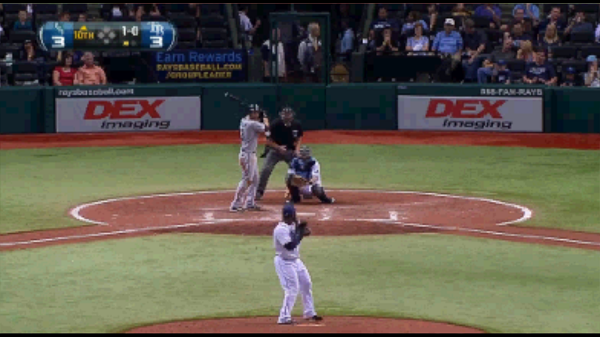 Why is Jose Molina such a good pitch-framer? What does he do? The rest of the stuff, I really…is when I’m catching, that adjustment that I make while the pitch is coming. A lot of people say that it’s just my hands, whatever, but it’s [the] adjustment that you gotta make when the pitch is coming. At the same time, with the body, you gotta know where the pitch is going. You gotta know your pitcher. Where he misses the most. He miss to the right, to the left, up, down, and we kinda cheat to those spots when they come. It’s a lot of knowing your staff. I keep going to that adjustment because you can angle it but if you don’t adjust to that pitch, particular that pitch in this particular zone, no matter what angle you are it’s gonna be a ball. It’s that adjustment at that last second. Molina is known to keep his body remarkably stable when he’s catching, such that he receives pitches as if he’s sticking a landing. It stands to reason umpires can be distracted by too much motion, and that they’ll be less likely to call a borderline pitch in the pitcher’s favor. But Molina talked a lot about this adjustment, this adjustment while the pitch is on the way, and I thought it would be helpful to see some images. It’s not just that Molina stays steady — it’s what allows him to remain so steady when the ball finally arrives. We’re going to look at two pitches: a 2-and-1 changeup thrown by Fernando Rodney to Jose Molina with a lefty at the plate, and a 1-and-0 changeup thrown by Fernando Rodney to Jose Lobaton with a lefty at the plate. I don’t intend to pick on Lobaton; he’s not bad. He’s just not Jose Molina. 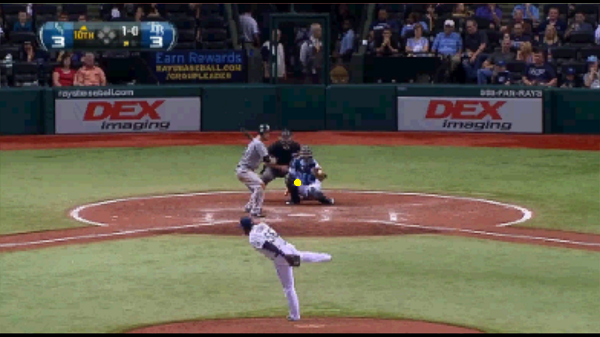 Both changeups were out of the rule book strike zone, outside, but Molina got a strike and Lobaton got a ball. Molina didn’t even catch the baseball cleanly, making the call somewhat more remarkable. Molina keeps his body stable upon catching the ball. But Lobaton also keeps his body stable upon catching the ball, and Lobaton still didn’t get it. Granted, the umpires are different, and these are borderline pitches. But let’s take a closer look. And think again about the difference in glove motion. Molina made it look like his glove barely moved. Lobaton moved his glove from one knee to the other. Molina got the strike, while Lobaton didn’t. And here, I think, is where we can see the adjustment that Jose Molina talked about on the podcast. Molina talked about having a familiarity with the pitchers, and knowing where they tend to miss. Lobaton set a target, and he held the target. Molina set a target, but immediately he started shifting a little to his left. He accounted for the fact that Rodney’s changeup would run away from the left-handed hitter, and he even closed his glove for an instant before re-positioning it. Molina prepared his body for a pitch around the outer edge, and now look at those bottom two stills. Molina catches the pitch in front of his chest. 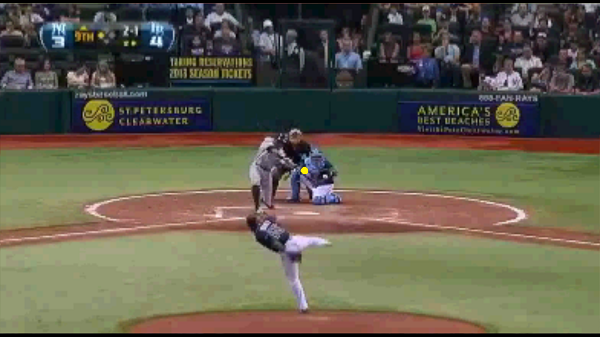 Lobaton catches the pitch more in front of his arm, making it seem further away. There might also be something to be said about Molina’s body angle versus Lobaton’s. In a Clubhouse Confidential segment, Dave Valle talked about the importance of setting your body such that the umpire gets a good look at the ball all the way through. It appears that Molina has his body at an angle, while Lobaton is a little more square to the pitcher. That could be some factor; when it comes to receiving, Molina is outstanding across the board. What I find interesting, though, and what Molina chose to highlight is the in-pitch adjustment. Molina and Lobaton called for similar pitches, and indeed they were thrown similar pitches. Molina was better prepared to catch the pitch that Rodney actually threw, perhaps owing to his familiarity with Rodney and the usual movement on his changeup. By no means is Lobaton a lousy pitch-receiver. But by no means is Lobaton as good a pitch-receiver as Jose Molina, because Molina has it all figured out. It really is a pleasure to hear the elite self-analyze. We hoped you liked reading Jose Molina on Jose Molina by Jeff Sullivan! Great stuff, Jeff. Thanks for putting this together.